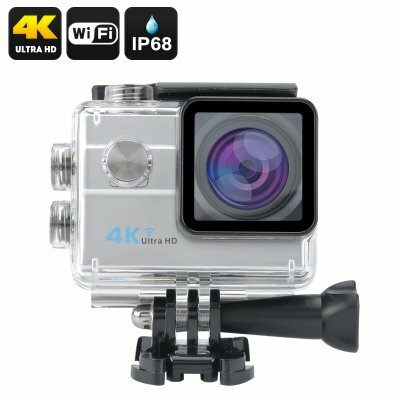 Successfully Added 4K Wi-Fi Waterproof Sports Camera - 173 Degree Lens, 16MP 1/4 inch Sony CMOS Sensor, 2 Inch LCD Display, HDMI Out (Silver) to your Shopping Cart. Make sure your most courageous moments are remembered. The 4K Wi-Fi action camera will make sure your adventures are saved in great quality and easily shared with the world. Capture all the excitement of your wild outdoor adventures in 4K! This action camera comes with an impressive ultra HD video resolution at 25 frames per second and will let you take stunning pictures at 16MP with the 1/4 Inch Sony CMOS sensor. With a 6x digital zoom you will have great detail in your images and the 173 degree wide angle will ensure getting a clear background for all your videos and images as well. Look over your images and videos on a compact 2 inch display and easily share with the world over Wi-Fi. Hook up the action camera to the TV screen with an HDMI cable and enjoy all your adventures in great resolution on a large screen. The camera comes with a waterproof case – making it a great gadget to take along when doing water sports. It also comes with a nice set of accessories and mounts to ensure a perfect fit whichever sports you are doing. With the 900mAh battery, you will get up to 1.5 hours of continuous filming and the cam will quickly recharge when needed. Sturdy, portable and waterproof it’s the perfect gadget for adventurers. The 4K Wi-Fi Waterproof Sports Camera comes with a 12 months warranty. Brought to you by the leader in electronic devices as well as wholesale sports action cameras.